In a large bowl, combine almond flour, tapioca, chia, xylitol, baking soda and salt. ingredients. Use mixer to combine, until it forms a sticky, wet dough. Pour batter onto a 12 x 16 inch cookie sheet or 16 inch round pizza pan, lined with parchment paper or a silicone mat. not over bake, or it will be dry. heat. Add fresh basil and spices. Simmer for 15 to 20 minutes uncovered. distribute the tomatoes, mozzarella, spices and herbs. Drizzle remaining olive oil over pizza. Bake at 425 F for 15 to 20 minutes, or until crisp and golden brown. the colors of the Italian Flag. 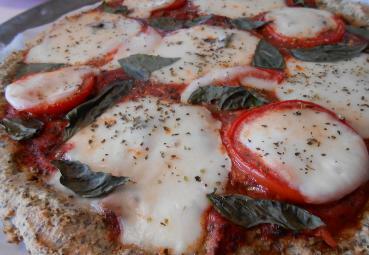 The tomatoes; (red), basil; (green), mozzarella; (white).